WTBs 2010 tyre line-up looks to be the most promising in the companys 28-year history. The heart of the line, the trail tyres, have with many features, including dual compound rubber, puncture protection, UST and TCS (WTBs Tubeless Compatible System). WTB’s 2010 tyre line-up looks to be the most promising in the company’s 28-year history. The heart of the line, the trail tyres, have with many features, including dual compound rubber, puncture protection, UST and TCS (WTB’s Tubeless Compatible System). “TCS tyres offer the best of both worlds,” says Katerina Rejchrtova, CEO of WTB Europe. “These tyres combine the benefits of tubeless with the minimal weight of an XC race tyre.” This versatile system combines WTB’s lightweight, race casing with a certified UST tubeless bead. 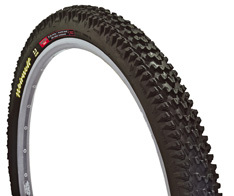 TCS tyres can be used with inner tubes and adapted to tubeless when combined with WTB-approved sealant and rim strips. The most remarkable tyre of the product line is the redesigned WeirWolf. The new WeirWolf is the product of a five-year collaboration between top endurance downhiller Mark Weir and WTB’s chief designer Mark Slate. According to WTB, it boasts unparalleled grip, predictability at any lean angle, and it’s packed with features. The tyre incorporates an extra row of transitional tread between the crown and side knobs and the side knobs are terraced (or stepped), which features an advanced, progressive flex design. In the initial stages of a turn, these knobs are soft and supple and conform to the terrain. The harder-or faster-the turn, the firmer the knobs become. This complex tread is quite possibly the most advanced design on the market. Additionally, the WeirWolf is available with Inner Peace (WTB’s puncture protection – thin strips of Nylon, integrated into the tyre’s sidewall, which offer the ultimate protection against pinch flats, cuts and punctures. ), dual compound and TCS. Wolverine 2.2 AM TCS and Mutano 2.4 AM TCS and Bronson 2.3 AM TCS.